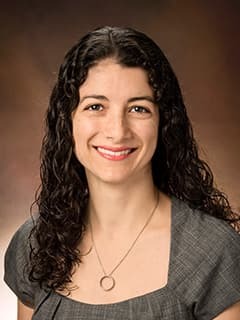 Lisa Fahey, MD, is an attending physician in the General Diagnostic Gastroenterology (GI) Program and the Celiac Center at Children's Hospital of Philadelphia. Fahey, LM., Robinson, G., Weinberger, K., Giambrone, AE., Solomon, AB.. Correlation Between Aeroallergen Levels and New Diagnosis of Eosinophilic Esophagitis in NYC. J Pediatr Gastroenterol Nutr. 2017 Jan;64(1):22-25. Miltaha, H., Fahey, L., Sajous, C., Morrison J., Muraskas, J. Influence of Perinatal Factors in Short- and LongTerm Outcomes of Infants Born at 23 Weeks of Gestation. Am J Perinatol. 2015; 32(7):627-32. DeGregoris, L., Engel, M.. Clinical Reasoning: Transient Cervical Cord Swelling in Monomelic Amyotrophy. Neurology. 2014;83;e77-e79. Fahey, LM., Liacouras CA. Eosinophilic Gastrointestinal Disorders. Pediatric Clinics of North America. Volume 64, Issue 3, June 2017, pages 475-485. Fahey, LM., Guan S., Liacouras C., Spergel, J., Hakonarson, H., Sleiman, PA., Cianferoni A.. (2017, June). The Correlation between TSLP Risk Alleles and Food Allergen Disease Triggers in Pediatric Patients with Eosinophilic Esophagitis. Komerov Gastroenterology Regional Research Competition at the University of Pennsylvania; 2nd prize award. Fahey, LM., Guzek, R., Ruffner, M., Sullivan, K., Spergel, J., Cianferoni, A.. EMSY Gene Silencing in the Esophageal Epithelium. Poster presented at Digestive Disease Week 2017 Annual National Meeting; Chicago, IL. Poster presented at 2017 CHOP Annual Research Day. Poster submitted to NASPGHAN 2017 National Meeting, Las Vegas, NV. Fahey, LM., Guan S., Liacouras C., Spergel, J., Hakonarson, H., Sleiman, PA., Cianferoni A.. (2016, October). The Correlation between TSLP Risk Alleles and Food Allergen Disease Triggers in Pediatric Patients with Eosinophilic Esophagitis. Poster presented at World Congress of Pediatric Gastroenterology, Hepatology and Nutrition; Montreal, Canada. Honored as Poster of Distinction. Poster presented at 2017 CHOP Annual Research Day and received Outstanding Patient-Oriented Research Award. Poster Presented at Digestive Disease Week 2017 Annual National Meeting; Chicago, IL and honored as Poster of Distinction. Fahey LM, Liacouras C, Spergel J, Hakonarson H, Muir A, Sleiman PA, Cianferoni A: "TSLP Risk Alleles are Increased in Pediatric Patients with Eosinophilic Esophagitis and Atopy," Poster Presentation. Digestive Disease Week Annual National Meeting, San Diego, CA May 2016. Fahey LM, Guan S, Liacouras C, Spergel J, Hakonarson H, Sleiman PA, Cianferoni A: "The Correlation between TSLP Risk Alleles and Food Allergen Disease Triggers in Pediatric Patients with Eosinophilic Esophagitis," Poster Presentation. World Congress of Pediatric Gastroenterology, Hepatology and Nutrition, Montreal Canada. Poster of Distinction October 2016. Fahey LM, Guzek R, Spergel J, Cianferoni A: "EMSY Gene Expression in Eosinophilic Esophagitis," Poster Presentation. The Children's Hospital of Philadelphia Research Poster Day 2016. Fahey LM, Semeao E: "Use of Aminocaproic Acid in a Patient with Multifocal Lymphangioendotheliomatosis with Thrombocytopenia," Poster Presentation. North American Society for Pediatric Gastroenterology, Hepatology and Nutrition October 2015.